Color Palette: Cream, Periwinkle, French blue, Tiffany blue, and Moss, Agate Green. 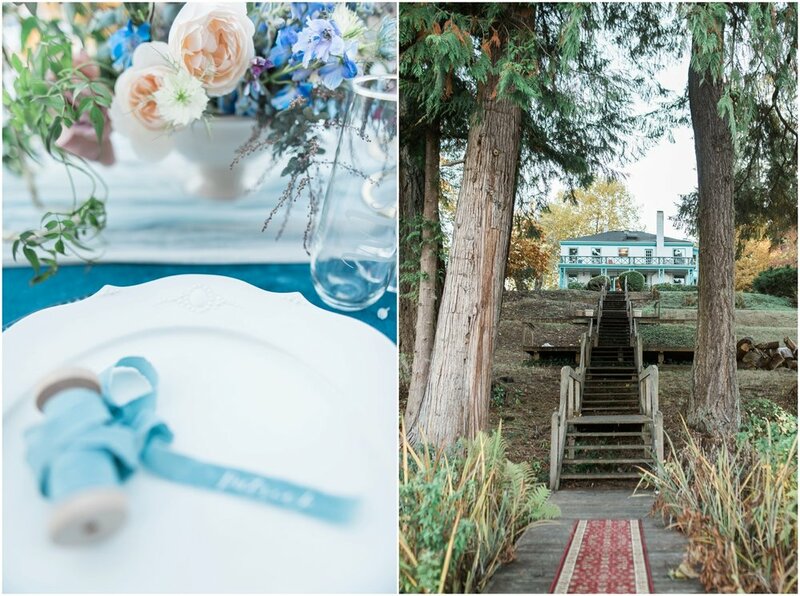 Vibrant Firs is a new wedding venue in Auburn, WA. It has a charming Colonial structure right by the lake, dock access, barn, gazebo, and 50 acres of land. Its exterior paint and front door design left a great impression on our first visit. As soon as we pull in the roundabout driveway, at the end of the brick path is the tiffany blue and white painted, column entrance. Along with the lake view, we immediately decide that we will be setting up a reception style table on the dock and some lounge pieces outdoors. Along with its exterior paint and the romantic storybook setting vibe, we put together the color palette in the range of cream, periwinkle, French blue, Tiffany blue, moss, and agate green. Our design concept focused heavily on vintage, antique items, layers of fabrics, and accessories with gold. Thus, we name our theme Colonial Fairytale. The advantage of choosing Vibrant Firs as a wedding venue is that it is very versatile. 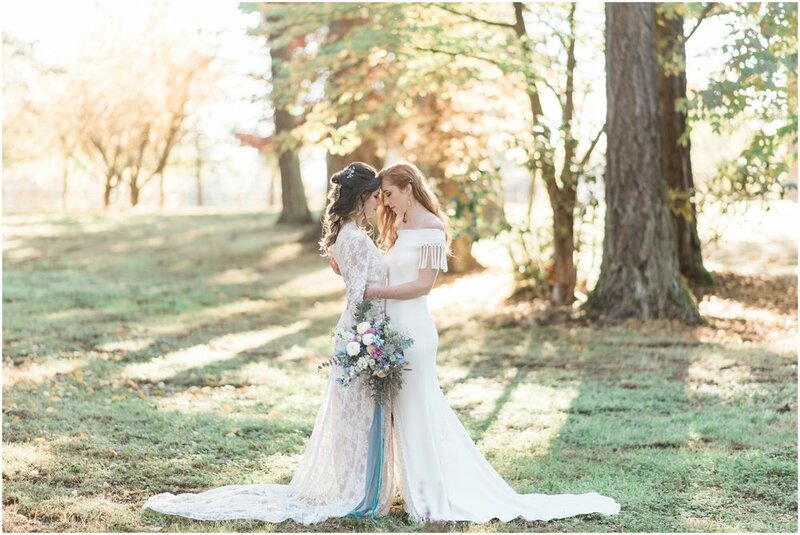 Couples can design their weddings more rustic, boho, or elegant, and Vibrant Firs would be perfect in any of these settings. It also provides plenty of indoor space inside the barn in case the weather changes. While putting together the reception table, we made the floral centerpieces smaller to showcase and blend into the gorgeous nature surrounding. We also fan out the flatwares a bit to make the place setting less formal and more homey. We layered two different types of lighter fabrics on top of the deep blue velvet table cloth and to make them jump out visually. The reception chairs are also clothed in Parchment Linette. At this point, we simple add more textures with taper candles and votives. 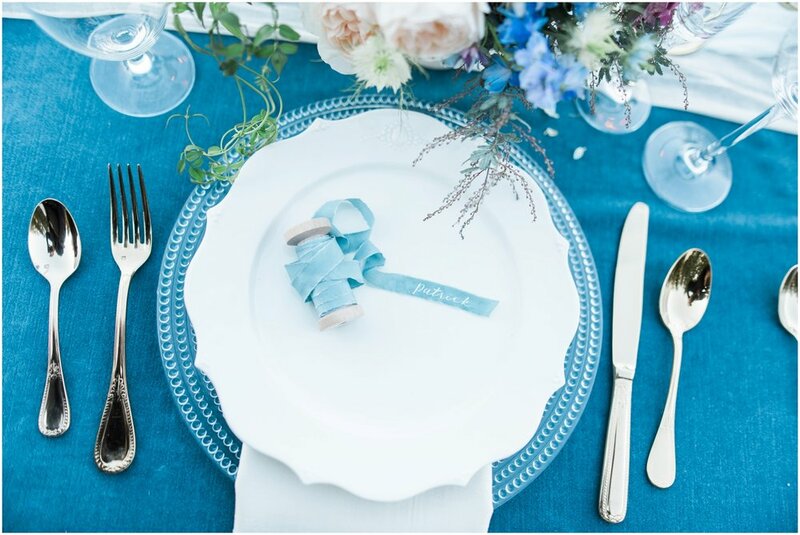 Our favorite part of the table is definitely the spools of ribbons that double as place cards and add a really personalized, special finishing touch. The delicate Robin Egg Blue silk ribbons are from Stella Wolfe, the width is 0.5”, skinny enough to leave lots of blank space on the plates. Our stationery designer worked wonders on the ribbons and wrote beautiful names in calligraphy. Flowers: We like to incorporate floral design when composing for the overall concept since they are so intimately tied together. For this design, we used lots of feathery, soft texture. 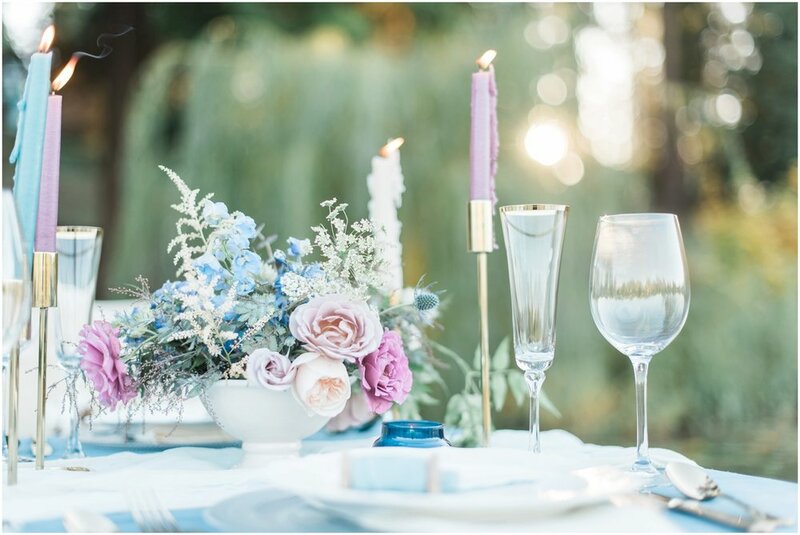 Our centerpieces are composed of field grown roses, queen anne lace, nigella, delphinium, yarrow cottage, eryngium, astilbe, and purple feather acacia. 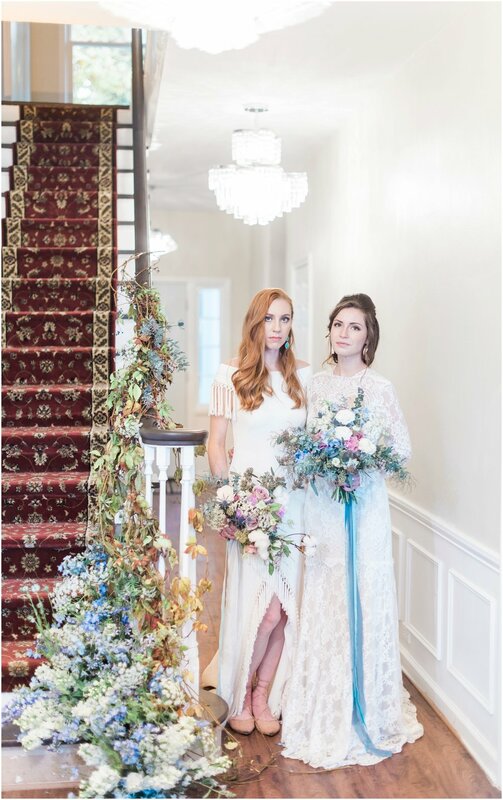 We also created two different style of bouquets, one more tender and aerial with cotton and another more exquisite with more blue floral pieces. The floral installations are set up indoors to feature the venue’s gorgeous fireplace and stairway. With our theme, we add Jasmine vines and virginia creeper vines to build the installation structure. Catering: Olive is inspired by nature and utilizes her home grown herbs, such as rosemary, to dazzle the gourmet hors d'oeuvres. Its lemony tang counterbalances a mild ricotta cheese on floral olive oil polenta coins. 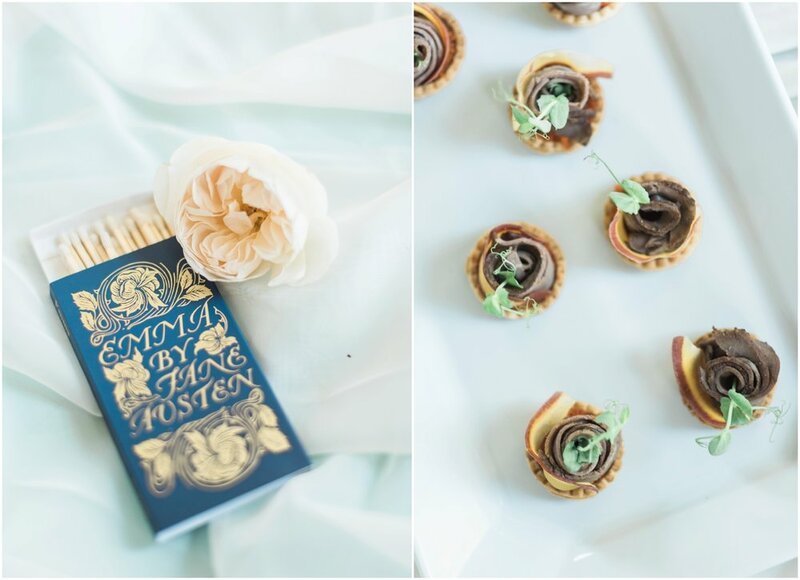 For the other much crunchier bites she creates a roast beef & rainbow carrots tartlet to pair with ceremonial champagne toast. 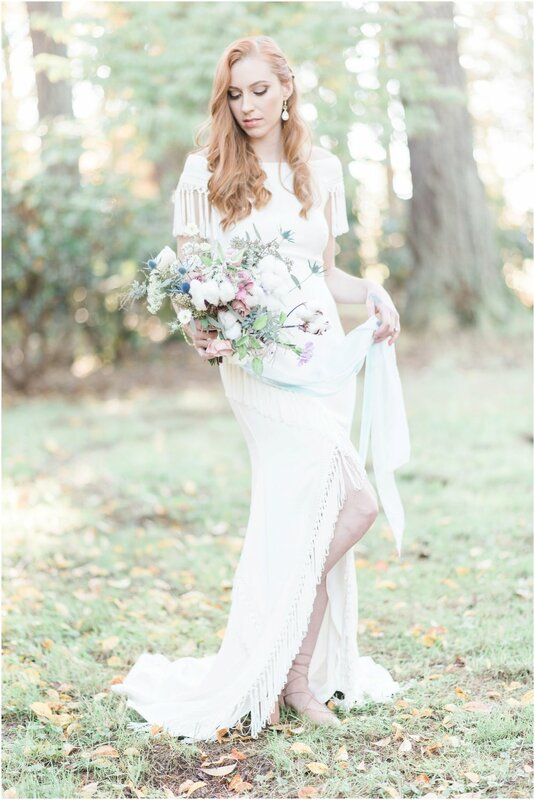 Blue and pale purple hues are her personal favorite. 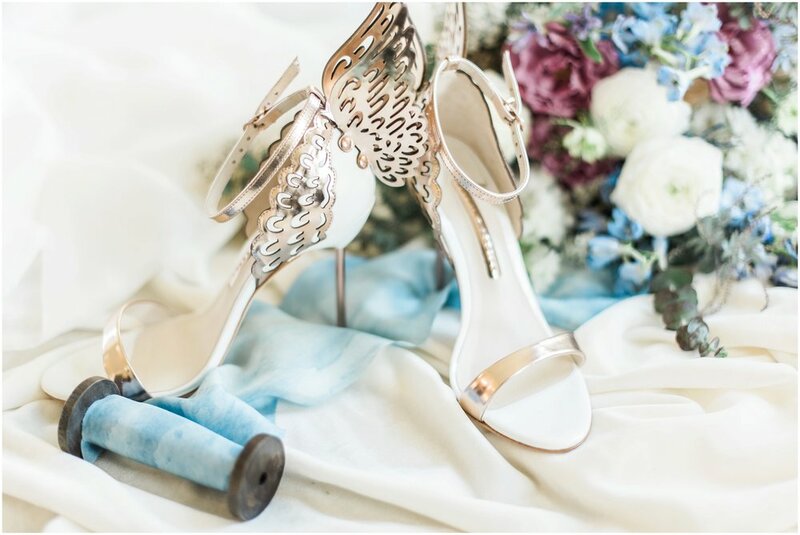 It creates a sense of elegance and turns the romantic elements more sensual. Blackberry and purple carrots were used as accent pieces to complement meat dishes. 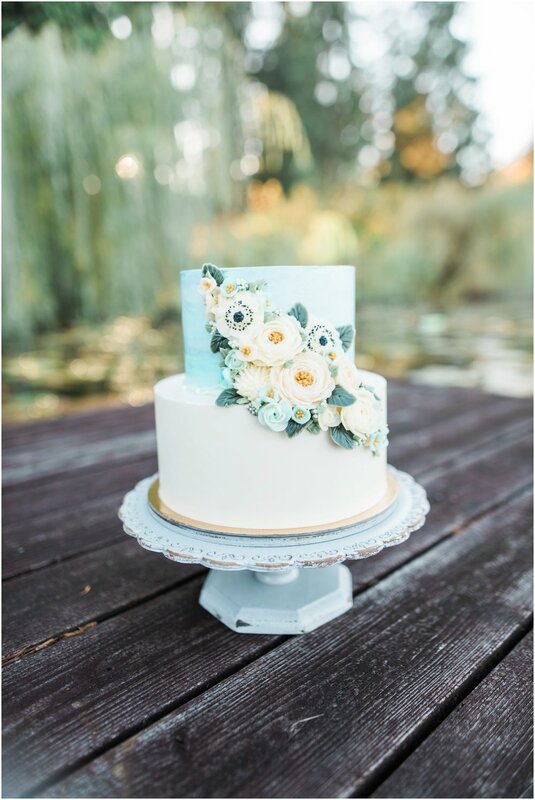 Cake: Jan creates a two-tier wedding cake featuring a smooth color block design with a blue watercolor top-tier and a center cascade of pure, hand-piped buttercream flowers inspired by the lake setting. Every aspect of the cake focuses on the simplicity of a traditional wedding cake while also capturing the unique detail and placements present in the buttercream flowers. Makeup & Hair: Clean and soft tone makeup creates the romantic outdoor look. For Tierney’s red hair, the classic curls give hair a clean look. 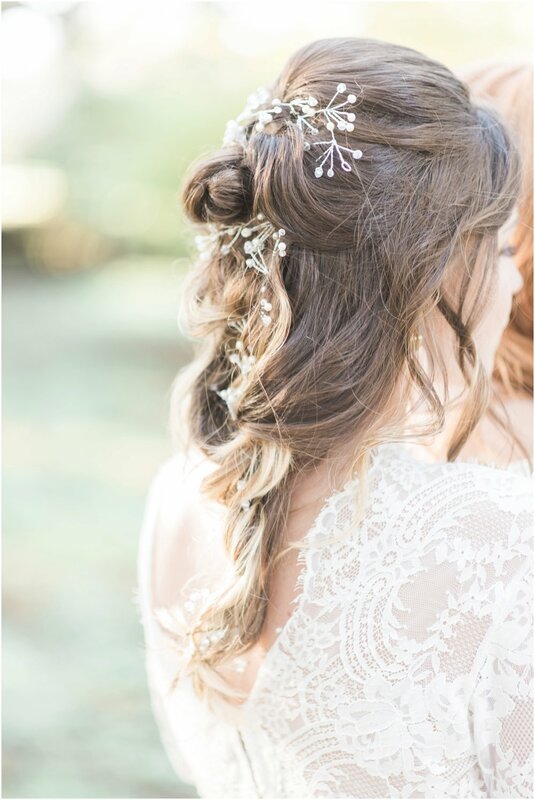 Very elegant and still appear as charming, the long curls give a vintage-inspired wedding day look. For Cristina’s brown hair, the curling, twisting and braiding creates a messy and not structured mermaid braid that falls effortlessly down the back to give this look a rustic twist! For Vian, an voluminous effect hair pushed to one side is classic and elegant. Wavy hair looks pretty and romantic, but it’s even more feminine when each individual wavy strand of hair comes together for a side-swept look. It frames the face and stops hair from getting on the face all day. 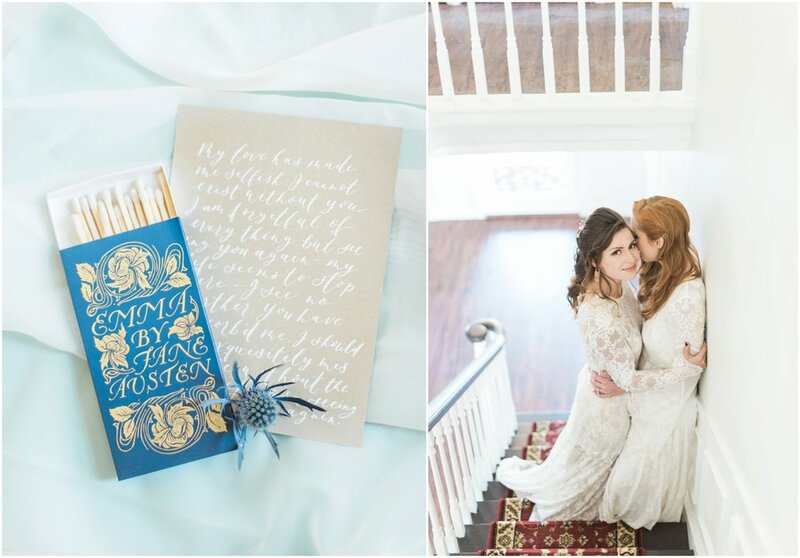 Stationary: The gorgeous Vibrant Firs venue and the “Colonial Fairytale” theme both played an equal part in my design process for the calligraphy and paper pieces of this shoot. 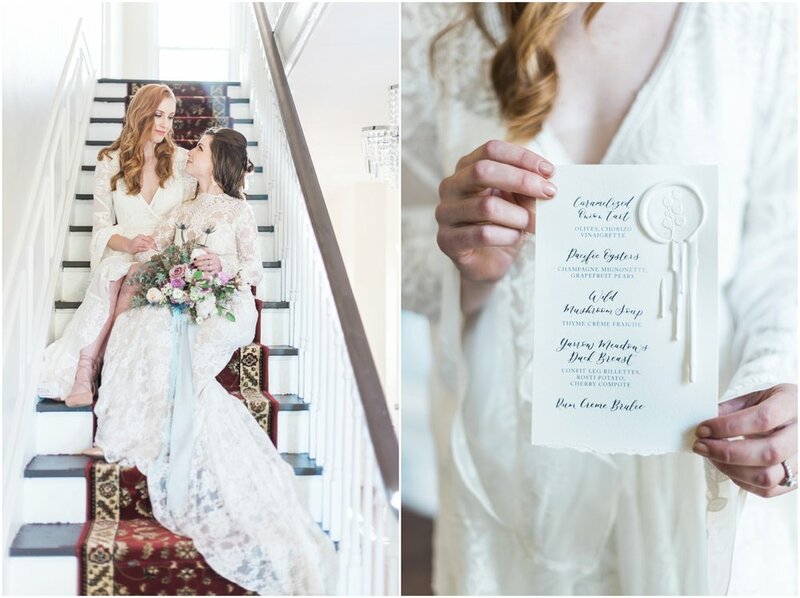 Soft blues, long calligraphy strokes, and an illustration of the venue’s iconic front door brought the suite pieces to life. For the menu design, I drew inspiration from reading by candlelight in the colonial era; the wax remnants of a romantic, soft white wax seal are suspended in time alongside delicate calligraphy paired with a classic typeface. 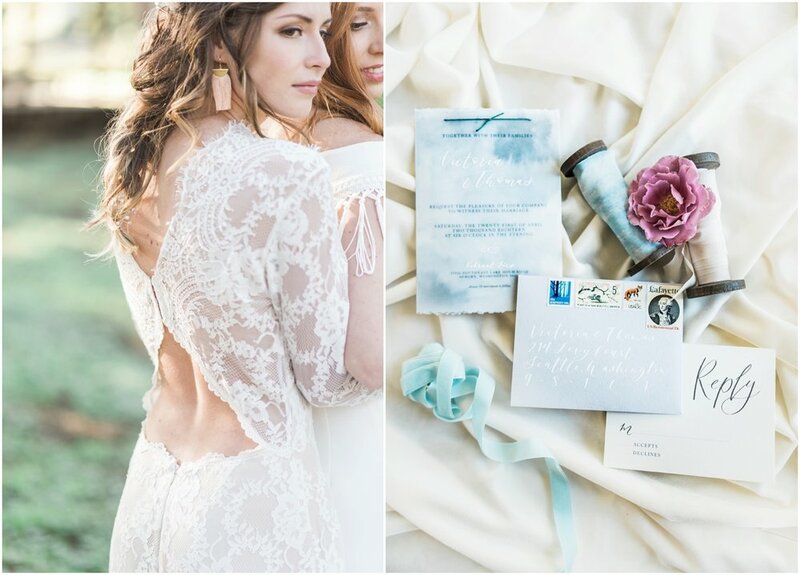 Finally, a love note and dusty blue vow book: perfect heirloom pieces for the romantic bride.